Shared with me in March 2009 & updated in 2013, thanks Anne! William Henry Pine was born in 1868 at Dotton Mill on the River Otter, near Exeter in Devon, England. This was his mother’s family home. His parents John James M. PINE and Anna CARTER were married just prior to his birth, his father worked as a shipwright initially at Exmouth, later at Dartmouth, Devon. William had a younger sister but his father died of TB when William was only 6 years old. His mother remarried Edward Bernard CODY, an army man, and William’s childhood was characterised by moves every year or two around different army bases in England & Ireland. He had many half siblings but in his teens he went back to Devon to live with a maternal uncle from whom he learnt the trade of corn milling. Whilst working at Southern Mill, Malborough, nr Kingsbridge, Devon, at 19 years old, William PINE married Elizabeth BOYCE at Malborough, Devon. She was eight years older, a farm labourer's daughter. William later worked at New Mills, Loddiswell, nr Kingsbridge before moving to Garden Mill, Dodbrook nr Kingsbridge which he took on from an uncle who moved a few miles away to another mill. William & Elizabeth's first son, John Marshall PINE was born 1888 at Loddiswell. From various newspaper accounts it would appear William PINE got into financial difficulties. I believe he tried to fake his own death in order to escape the country and get an insurance pay-out to support his wife and family. His wife was heavily pregnant - my grandmother was born three months after her father disappeared. In March 1891, William PINE hired a boat to sail the short distance from Kingsbridge to Salcombe – this was part of his custom to make contacts in connection with his milling business. However in the darkness the boat was discovered with broken mast and no occupant. At first William PINE was thought to have drowned, local people started to dredge the estuary but within a couple of weeks suspicions were aroused. William Pine went to America but it's unclear quite when he arrived. From ships passenger lists, possibly he is Wm. Hy. Pine aged 24yrs who departed Liverpool on 21st June 1893 on the 'Germaninc' with Captain Thomas Nicol. The port of arrival New York, America. William’s uncle, Joel R. CARTER had emigrated to America in 1865. He had run a very succesful oatmeal milling business in Akron, Ohio and later in Peoria, Illinois. He also had business interest in Kansas and later lived in Sacramento, California. C1891/92. William PINE had cousins in both Peoria and Sacramento. William PINE also had a maternal aunt Sarah, who emigrated to America in 1873. 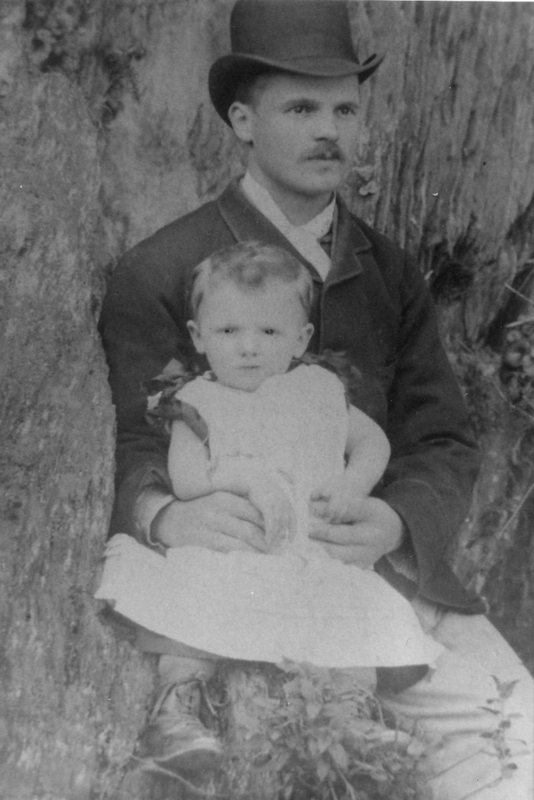 By 1891/92, Sarah had two daughters and was living near Akron, Ohio with her second husband Joseph LEHMAN, a farmer. I don't know if William PINE ever met these people or infact whether he ever communicated with them. Possibly. William wrote regularly to his wife back in Malborough, Devon, England. At some point he asked for his wife to join him in America. It must have been a huge decision for Elizabeth to take. 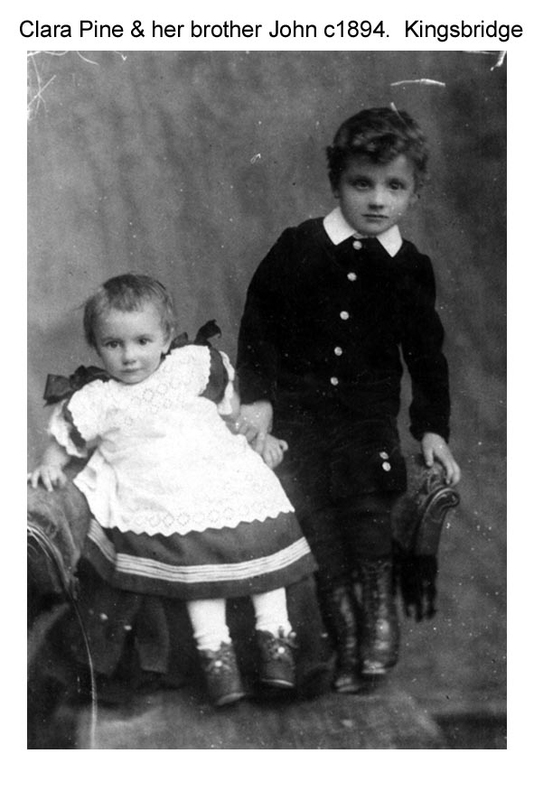 But preparations were made and Elizabeth Pine with her 2 children, John born 1888, and Clara born June 1891, sailed from Southampton to New York. Their ship, renamed ‘New York’, sailed under the American flag with Captain John C. Jamison and 780 passengers including the three Pine’s. The ship left Southampton on 19th May 1894. After about a 28 day voyage, Elizabeth and the children would have gone through Ellis Island, the receiving point for immigrants opened on 1st January 1892. By 1895 the reunited family were living at 2424 2nd Avenue, Manhattan, New York. My grandmother, Clara Pine, told me many stories of the big apartment blocks and an overhead railway. She claimed to remember sliding down the banisters, an old man who taught her how to polka and a Chinese man who ran a laundry nearby. As a small girl, my grandma enjoyed life in Manhattan. The family has retained one page of a letter, dated 1895, that Elizabeth PINE wrote to her sister back in Malborough, Devon. Life in Manhattan would have been a world away, totally different to anything Elizabeth had experienced before. It would appear Elizabeth was very homesick. On 30th May 1895, William’s wife, Elizabeth gave birth to twins. Only one survived. He was named Charles Edmund. On the American birth certificate, William PINE was described as a dry goods salesman. ‘Dry goods’ is an archaic American term for cloth, cloth products, thread etc. It could be William PINE sold dry goods to retail stores, or worked at the dry goods counter in a retail store, or perhaps he had a push cart and sold goods door to door in the streets of New York. Sometime later that year, in 1895 the PINE family returned to England. My grandma could remember the sea, ‘miles and miles of it as far as the eye could see’. Elizabeth PINE with 2 children and a very young baby travelled by train to Ottery St Mary, Devon. My grandma remembered being met by someone with a horse and trap. They were taken to Dotton Mill where they sojourned for a while before returning to Malborough. My grandma was 4 years old. It is doubtful William PINE ever returned to Devon. After a very brief time, William PINE travelled from Liverpool back to New York alone. He travelled on the SS Teutonic, which arrived in New York on the 26th December 1895. His passenger record notes he was an American citizen, married, a salesman returning to live in New York. 1897 in Cripple Creek, CO. In 1895 in New York, William Henry PINE developed further contacts and eventually trekked west to the gold fields of Cripple Creek, Colorado. The first gold was struck at Cripple Creek in 1890, but the real boom began in 1891, with W.S.STRATTON's discovery at the Independence Mine. Within eight years Cripple Creek grew to a population of 35,000. Fourteen other towns sprang up in the district almost overnight. In all some 75,000 people thrived in an area known throughout the world as the Cripple Creek District. Three railroads and two trolley car systems served the District. 56 trains a day moved throughout the area hauling gold ore, miners and visitors. Peak production, with 475 mines, was reached at the turn of the century. William must have quickly struck lucky and proved himself as a miner. After only one or two years in the District, by 1897, he was Superintendent at the Old Gold Tunnel, under the west side of Beacon Hill. He also owned half the interest in the Old Gold Tunnel and tunnel site. A newspaper report in the Denver Republican, 28th December 1897, gives details of the opening of a new mine. The Londonderry on Ironclad Hill is about in the centre of six patented claims that were purchased some three or more years ago by a party of Eastern gentlemen, none of whom have ever set eyes on their property. It appears that at all times the majority of the owners were anxious to develop their holdings but one individual objected. He was willing to lease and bond however, so the others organised the Devon Mining, Milling and Development Company and have placed W.H.PINE, a good miner and competent businessman, in charge of operations, with instructions to open up a mine. He has started in with a will, and will undoubtedly succeed as the territory over which he has supervision has long been considered one of the most promising portions of the camp. The dirt on the surface all carries gold, and in the early days the Londonderry marketed some very high grade ore, as did the Climax, another of the properties in the close corporation. On the Londonderry there is a shaft 200ft deep, and it is to be doubled in depth before a drift is started. As soon as the compressors are needed, the money is in hand in the bank to buy them, as well as every other necessity. The company buys strictly for cash and pays all its miners in full at the end of the week, which is a novelty in this camp and in most others. However all did not go well and in April of the following year there was a terrible mining disaster. Again the newspapers gave details. From the Morning Times, 24th April 1898. Three men are thought to have lost their lives last night in what was one of the most terrible accidents ever known in the history of the district. Two were suffocated in a burning shaft, and the third, the superintendent of the ill fated mine, was lost in a brave effort to rescue them. and W.H. PINE, superintendent of the mine. ’Guilty of Negligence, this was the verdict of the jury’. It would appear at the time of the fire, the Superintendent of the mine, William PINE was on duty at the top of the mineshaft but that he had stepped aside for a moment. The newspaper reported that Pine had made such atonement as he could by giving up his life after it was too late to do anything for the men below. I have a copy of a lengthy letter from Albert E. GROVES of Cripple Creek to Mrs Elizabeth PINE of Malborough, Devon. It was this letter that carried the news of the death of her husband. 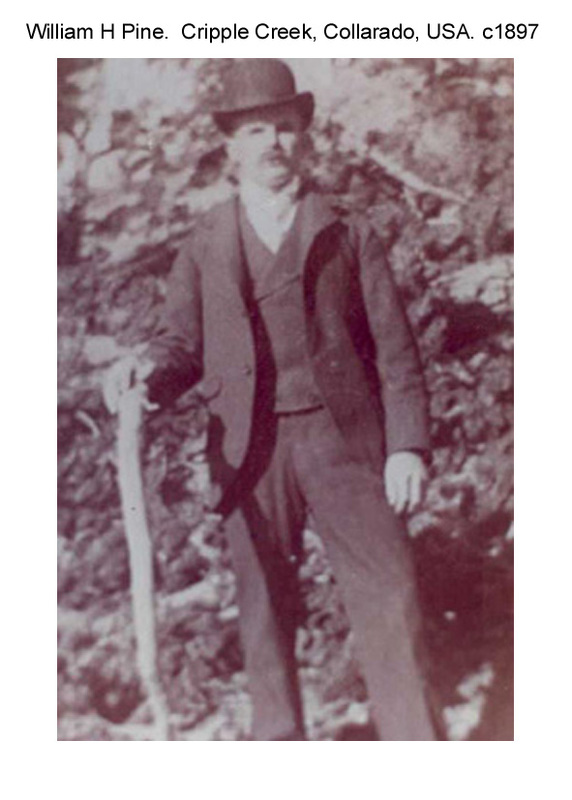 Albert GROVES was one of the men who with William PINE had entered the mineshaft and had tried to rescue the trapped men. His description of events is similar to that given in the newspapers. He said PINE was the first to gain the ladders and was followed below by two others. They descended amid smoke, live ambers and foul air. After descending about 170ft GROVES said he had to go back. PERRIOT, the next man went another 50ft but then turned, barely having the strength to return to the top. When asked where PINE was, PERRIOT said he was a further 25ft into the shaft and asking for more ropes to be sent down. When cautioned to be careful his last words were, ’I must do my duty’. GROVES goes on to say PINE was amongst friends and they were caring for his body giving him a respectful burial that afternoon. The body of one of the other miners was sent to his father in Iowa but PINE was to be buried 12ft apart from the body of miner Mr JONES. Services would be conducted at the Baptist church. GROVES says ‘the most comforting words I can speak to you is that Mr PINE died a Christian. He was a very earnest man working in the church and the members of the church are surely very kind and doing all they can for their departed friend and brother although apparently in a land of strangers. The letter concludes with 10 signatures and the comment that there was a very large funeral and a crowded church. On the letter a cross is placed by the names of the men who were pallbearers. A promise is made that flowers and cards ‘that speak of the sympathy and love of his friends’ would be sent on to Elizabeth PINE in Malborough. To whom it may concern. This is to certify that I Oscar LAMPMAN, undertaker of the firm FAIRLY Brothers and LAMPMAN, buried William Herbert PINE on 26th April 1898, who died 23rd April 1898 in Cripple Creek, Colorado. Said William H. PINE is buried in Mount Pisgah cemetery in 6 1/2 of Lot 18, Block 20. Deceased was about 5 feet 9 inches tall, sandy moustache, thin growth of hair and a high forehead, aged about 30 years. I have various maps indicating the position of the various mines, the township of Cripple Creek, and Mount Pisgah cemetery. I also have some photographs of William Henry Pine and other miners at the surface. By considering the life of Brother PINE, in his very short sojourn with us, we see what can be done by taking a firm stand for the Lord Jesus, even though the person may be in humble circumstances, and only fairly equipped for the work of life. His last testimony in prayer meeting, a week ago Wednesday night, was that he offered himself a living sacrifice to God, and that he considered it only a reasonable service. Oh. Young brothers and sisters, who have recently entered the Christian life, do as Brother PINE did. Give God all you have and are, if you would get joy out of the Christian life, and if you really wish to be of use. Elizabeth PINE had to deal with several business matters connected with her late husband. I have copies of various letters sent to Elizabeth PINE from Orlando M. HARPUR, Commission Merchant, 69 Worth Street, New York. HARPUR goes on to explain that there had been insufficient time to decide if the work PINE had undertaken with such vigour would be continued or not. If it were and if it achieved success then HARPUR stated he would see that justice be done to Elizabeth PINE, in her husband’s interest. From subsequent letters it would appear work continued awhile. However capital costs greatly exceeded initial expectations and it would appear that although the company extracted some gold it was not in any vaste quantity. I have a copy of a further letter, dated April 1899 and written by G.C.BRADBURY to Elizabeth PINE in Malborough. BRADBURY was one of the miners who had signed the initial letter telling Elizabeth of her husband’s death. It would appear Elizabeth had been in correspondence with him and that BRADBURY was now returned to New York and again employed in the woollen business. I think PINE and BRADBURY could have been colleagues together in New York before they made the trek west to the goldfields. Maybe Elizabeth PINE had even met BRADBURY during the short period she had lived in New York. In the letter BRADBURY informs Mrs PINE that he didn’t think her husband had money in any bank account and that it would be an unwise expense to go to ‘administration’. BRADBURY said PINE had no personal effects, and no clothes except those in which he was buried. In the new graveyard, Malborough, Devon, England on the family stone, the death is recorded of William Henry PINE of Cripple Creek, beloved husband of Elizabeth PINE. In Malborough, Elizabeth PINE was greatly supported by her unmarried sister Catharine BOYCE who ran the village shop. (Again we have lots of photos of the family in Malborough, school photos, pictures of the shop etc). The family were ardent Baptists, and the children able scholars. Clara particularly enjoyed violin lessons with Elsie BLAKE. 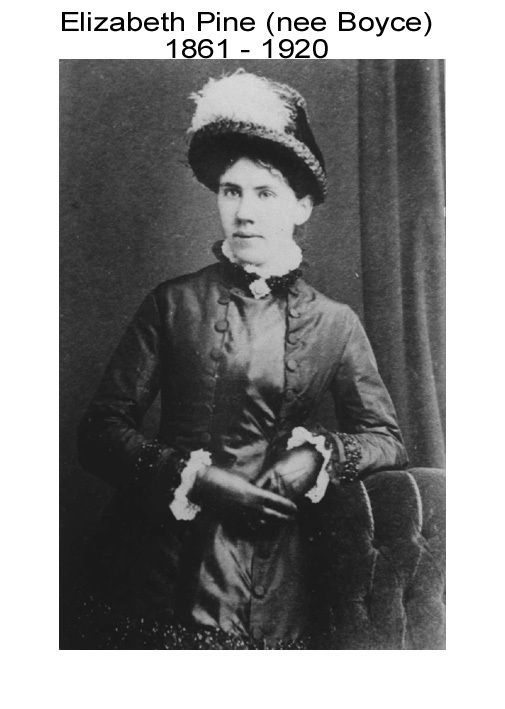 Clara and her two brothers lived with their mother up until 1911 when John and Charles PINE emigrated to Canada. (Charles later moved to America). Throughout her life Clara regularly wrote letters to each of her brothers, although she never saw John again. The only time she saw Charles was when he briefly visited England for a holiday c1947. Clara remained in Malborough and met Arthur Charles WILLIAMS c1916. He was a lot older than her, a widower with a young son. He had been born in London but had been in South Africa with the Civil Service before becoming a wireless operator on merchant ships. My grandad travelled the world – there are few places he hadn’t visited. During the First World War his ship was torpedoed but survivors were hospitalised on Malta. He was trained in land based wireless operations at Bolt Head, Malborough, Devon. My grandparents were married at Malborough in 1919 and then set up home in Forest Gate, London. Grandad worked on Australian mail ships for many years until he and Clara started the ‘Dinkie Stores’ a village shop in Cheshunt, Hertfordshire about 20 miles from central London. They had 2 children, my Dad Charles and my aunt Mary. My grandad retired c1935 and the family moved to Enfield, in north London. During the Second World War the family went back to Malborough for several years. They stayed with Elizabeth PINE’s sister, known to all as Aunt Kate. Dad attended Kingsbridge Grammar School and Mary went to Twyford school. Grandad lived till he was 96 years, and grandma until she was 88 years but my Dad developed cancer and died in December 2005, aged 79years. Dad and Clara always loved returning to Malborough for holidays. Devon is very dear to our hearts.